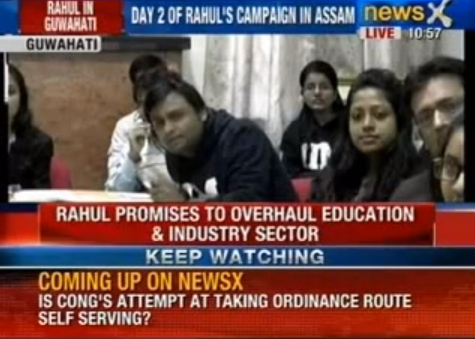 During an interaction with students from various educational institutions of Northeast on 26th February 2014 at the Don Bosco University in Guwahati, the students of IIM Shillong got a chance to interact with Congress Vice-President Rahul Gandhi by means of a video conference. Placing emphasis on the development of Northeast, the Congress vice-president said that the region needed better connectivity and the people of these states must feel comfortable in other parts of the country. He assured that the issue of poor connectivity in the North East would have to be aggressively addressed to properly utilize the productivity of the people. “The reason for the energy of the North-East people not being properly utilized is because of poor connectivity in the region”, Gandhi said in response to the query raised by Jain. He also spoke about the incidents like that of Nido Taniam from Arunachal Pradesh, which has proved to be a barrier for movement of people. As managers of tomorrow who will hold respectable positions in various companies in India Inc. the students of IIM Shillong were fortunate to have interacted with Gandhi. It was an interaction that allowed them to participate by understanding the issues concerning the development of the region as well as strive to provide plausible solutions to the same.